Second-half struggles spelled the end of the season for the University of the Fraser Valley men’s basketball team on Saturday afternoon, as they dropped an 84-59 decision to the Winnipeg Wesmen in Game 3 of their Canada West first-round playoff series. The Cascades led by as many as 12 points in the first half at the University of Winnipeg’s Duckworth Centre, and took a 34-30 lead into the break. But the last 20 minutes were dominated by the Wesmen – the hosts blitzed UFV 31-9 in the third quarter and continued to roll in the fourth to seal the best-of-three series victory. The Wesmen move on to face the No. 2-seeded Saskatchewan Huskies on the road in the Canada West quarter-finals. Saturday’s result marked the conclusion of Manny Dulay and Vijay Dhillon’s Cascades careers. Dulay notched a team-high 11 points to go with five rebounds and five assists, and fellow fifth-year guard Dhillon had seven points and four boards. Rookie guard Narcisse Ambanza led the charge for the Wesmen, racking up 22 points on 9-of-14 shooting from the field, and Denzel Lynch-Blair (19 points) and Sean Tarver (14 points) also made significant offensive contributions. The Cascades had a solid first half – they led 15-10 at the end of the first quarter, and stretched the lead to double digits after Andrew Morris opened the second with a two-point jumper followed by a triple on the next UFV possession. The Wesmen, though, found some traction midway through the frame, authoring a 9-0 run with four points from Ambanza, and cut the deficit to 34-30 at the half. The third quarter was all Winnipeg – they turned the tables on the Cascades with a 17-4 run, as the visitors struggled to contain the Wesmen’s dribble penetration. 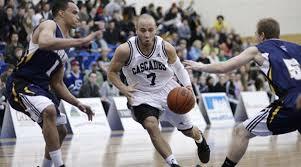 At the other end, Winnipeg made life difficult for Dulay – coming off a sensational 29-point performance in Friday’s Game 2 win – and the rest of the Cascades. With their season on the line, Kayli Sartori and her University of the Fraser Valley women’s basketball teammates mustered a gritty effort, defeating the Calgary Dinos 61-59 on Saturday evening in Game 2 of their Canada West first-round playoff series. Playing at UFV’s Envision Athletic Centre, Sartori racked up a game-high 23 points, highlighted by a tough driving layup plus the foul with just under a minute left in regulation to expand a slender one-point advantage to four and allow the Cascades to extend the best-of-three set. Game 3 goes Sunday at 5 p.m. at the Envision Athletic Centre. The Dinos had posted a decisive 67-48 victory in Friday’s opener, but the Cascades turned in a tougher team-wide performance to even things up. Taylor Claggett was at her rugged best, scoring 11 points and grabbing nine rebounds, and Sara Simovic and Shayna Litman added seven points apiece. Erin McIntosh (21 points) and Michal Assaf (20 points) did the bulk of the scoring for the Dinos, while Brianna Ghali – a thorn in the Cascades’ side on Friday with 20 points and 16 boards – was limited to five points. While the Dinos fared well on the boards, the Cascades took the turnover battle, giving the ball away just 10 times compared to Calgary’s 18. The hosts were locked in defensively from the opening tip, building a 15-4 lead at the end of the first quarter. The Dinos mananged an 8-0 run early in the second, but the Cascades regained control and led 30-22 at halftime. UFV expanded the advantage to 18 points (43-25) on Litman’s layup midway through the third quarter, but Assaf scored eight straight points as part of a 10-0 Dinos response, and the visitors were back to within 47-43 at the end of the third. Calgary leveled the score on two occasions in the last five minutes of regulation, but Litman knocked down clutch shots on back-to-back possessions and Sartori followed with a pair of driving layups (and an and-one free throw) to give the Cascades some breathing room. Simovic went 3-for-4 from the foul line in the dying seconds before Assaf hit a buzzer-beating three to provide the final margin. Tuchscherer was pleased with how his veterans – Sartori, Litman, Simovic and Syd Williams – responded after Friday’s struggles. Sartori said that Game 3’s outcome will hinge on which team wants it more. The University of the Fraser Valley women’s volleyball team clawed out a five-set victory over their crosstown rivals, the Columbia Bible College Bearcats, on Saturday evening to close out the PACWEST regular season. Playing in the North Gym at the Envision Athletic Centre, the Cascades (9-15) completed a sweep of the home-and-home series, having picked up a four-set triumph at CBC on Thursday. They head into the conference playoffs at Vancouver Island University next week as the No. 5 seed, and they’ll face the No. 4 College of the Rockies Avalanche in the quarter-finals. The Bearcats (4-20) fell short of qualifying for the PACWEST post-season. The Cascades got off to a solid start on Saturday, winning the first two sets by 25-17 and 26-24 scores. CBC, though, dug deep and took the next two 25-20 and 25-23, reeling off the last five points of the fourth set to send it to a fifth. The hosts steadied themselves at the finish, prevailing 15-9 to head to the post-season on a winning note. “They (the Bearcats) are a team that’s high-energy, and they love that crowd,” Cascades head coach Mike Gilray said, alluding to the CBC faithful who made the short journey across town to UFV. “I think they were able to play really free in that this was the last game of their season and they had nothing to lose. A team like that is scary, because they can just whale. When their swings were in, they had some big hits and they’re hard to slow down. If they miss big, they miss big. The Cascades’ sibling duo of left side Rachel and setter Jessica Funk set the tone offensively once again on Saturday, and Kim Bauder – limited by injury for much of the second semester – also had a strong performance, particularly at the service line. The game marked the home-court finale for Cascades middle Mandelyn Erikson. The Delta, B.C. product is in her third year of eligibility, but she’s been at UFV for four years with one redshirt season. She’s set to graduate in the spring and intends to move on. Gilray termed Erikson a “great leader” with a unique ability to connect with younger players on the team. The University of the Fraser Valley men’s volleyball team concluded the PACWEST regular season in clinical fashion, defeating the Columbia Bible College Bearcats in three straight sets at the Envision Athletic Centre on Saturday evening. It was the final home game for Cascades fifth-year right side Joel Kleingeltink, and as such, the stands were packed. The hosts squad sent the UFV fans home happy, prevailing by scores of 25-14, 25-17 and 25-18. The Cascades (17-7) enter next week’s conference playoffs as the No. 2 seed and have a bye to the semifinals, while the Bearcats finished an 0-24 campaign. “I thought we started every set really well,” said UFV bench boss Kyle Donen, whose team is ranked No. 6 in the nation. “I didn’t think we had great middle portions of the sets today, but we rose to the occasion when we needed to. Kleingeltink punctuated his Senior Night by racking up a team-high 10 kills and an ace. Nick Bruce, Ben Friesen and Dayton Pagliericci chipped in with five kills apiece, and middle Connor Pruim had five blocks to go with four kills of his own. “It was wild,” Kleingeltink said, reflecting on the packed house for his UFV home-court swan song. “Because the game started a little bit late with the girls going to five (sets), you started seeing how many people were trying to get into the gym – lined up out the door almost waiting for it to clear out a little bit. And during warm-up, usually I try to ignore the crowd, but I could hear it and see it and there were a lot of friendly faces out there. I had to try to acknowledge them. Be the first to comment on "UFV Sports Saturday – Men’s Basketball Season Is Over"